Launching of KRI Alugoro (405) at PT PAL's shipyard in Surabaya. Photo c/o Antara. 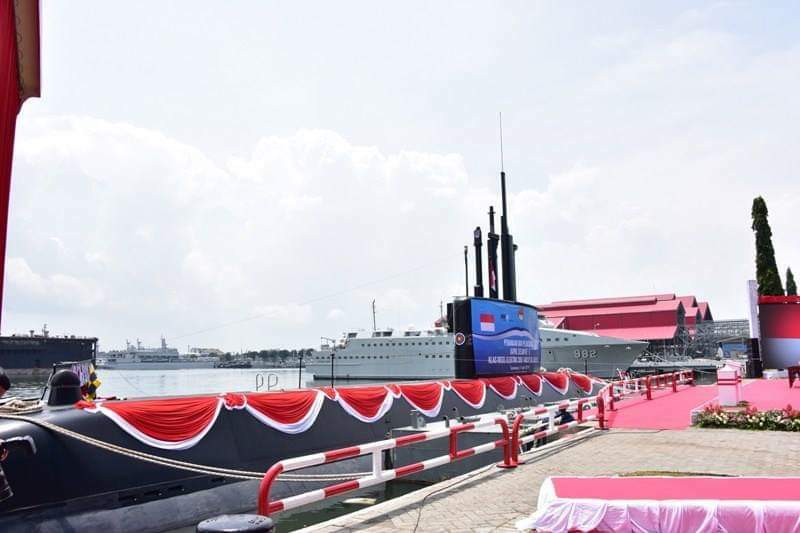 Indonesia’s state-owned shipbuilder PT PAL launched on 11 April 2019 the third ship of the Nagapasa-class diesel-electric submarine for the Indoensian Navy (TNI-AL), the KRI Alugoro (405), in their yard in Surabaya. The launching schedule was moved 1 day earlier to accommodate VIP guests to grace the event. The KRI Alugoro is the first submarine to be assembled locally by PT PAL, and by any Indonesian shipyard in general. The Indonesian Defense Minister Ryamizard Ryacudu also declared that Indonesia can now build submarines, and is the only ASEAN country to do so. The Nagapasa-class is a derivative of the South Korean Chang Bogo-class, which is turn is a Korean derivative of the German Type 209/1400 diesel electric submarine. The KRI Alugoro is part of a US$1.1 billion deal between South Korea and Indonesia to supply and build 3 submarines for the TNI-AL. Part of the deal includes technology transfer, and the local assembly of the 3rd submarine. Indonesia now hopes that they could export submarines in the future.